The Bushveld region is situated in northern South Africa. The climate is subtropical, characterized by hot summers with thunder showers and warm to mild winters. The plants in this region have a summer growing cycle. The typical vegetation consists of savanna, grassland with trees and shrubs. These include flat-topped acacias (Acacia spp. ), flat-crowns (Albizia, spp. ), bush willows (Combretum spp. ), corkwoods (Commiphora spp. ), wild figs (Ficus spp. ), mopane trees (Colophospermum mopane), and baobab trees (Adansonia digitata). The region is also rich in succulent plants especially Euphorbia, Aloe and Sansevieria. Mother-in-law’s-tongue (Sansevieria spp.) is in parts especially very common. The succulent plants found here, compared to the winter growing succulents of the succulent karoo are larger, thickset often with cylindrical stems, but have a much lower diversity. The region is vast, extending to tropical Africa in the north. Geologically it is also diverse. Rock formations introduced into the conservatory include Sand River gneiss, sandstone, dolomite and Waterberg conglomerate. The baobab (Adansonia digitata) is the central feature and largest plant in the conservatory and now well established. It is deciduous, losing its leaves in May and producing new leaves at the end of November each year. It is a great survivor in spite of heavy abuse in the African savanna by man and beast. Elephants eat the tree bark. Local people strip the bark to make mats and use the inner part of the tree as shelter. Other interesting introductions include bushveld star-chestnut (Sterculia rogersii), mopane trees (Colophospermum mopane), various cork barks such as green-stem cork bark (C. marlothii), velvet cork bark (C. mollis), string-bark corkwood (Commiphora discolor), satin-bark corkwood (C. tenuipetiolata), slender corkwood (C. virgata) venom corkwood (C. viminea) and the tall common corkwood (C. glandulosa). The mopane tree was also introduced but kept low due to its potential size. The hairy-leaf rock fig (F. tetensis) has been introduced to the rocky ridge below the baobab tree. Other noteworthy introductions include the bushveld dragon tree (Dracaena transvaalensis) which is endemic to the dolomitic formations in the Olifants River Valley of Mpumalanga. It is a small tree (or branched shrub), bearing rosettes of dark green leaves and warty fruits. It belongs to the dragon tree family, Dracaenaceae and produces its large inflorescence during the summer. The flowers open during the night. They are scented and pollinated by moths. Four local Sansevieria species were introduced; S. pearsonii, S. hallii, S. hyacinthoides and S. aethiopica. The Mpumalanga region holds the world’s richest concentration of aloe species. Typical aloes introduced include Aloe alooides, A. angelica, A. chabaudii, A. globuligemma, A. fosteri, A. aculeata, A. branddraaiensis, A. burgersfortensis, A. immaculata, A. vogtsii, A. petrophila and A. monotropa. he indigenous leopard orchid (Ansellia gigantea) normally grows epiphytically on mopane bark (Colophospermum mopane), occasionally on rocks. It forms dense clusters and has been planted along the step railing, It flowers in spring. Eulophia petersii, another terrestrial orchid has large green succulent pseudobulbs formis clusters among the Sansevieria and aloes. Drimia epigea a large bulb bearing rough scales and an elongated inflorescence to 1,5 m, is also prominent here. Gasteria batesiana a small aloe-like relative has been introduced from Mpumalanga and planted among dolomite rocks. It flowers in late spring. 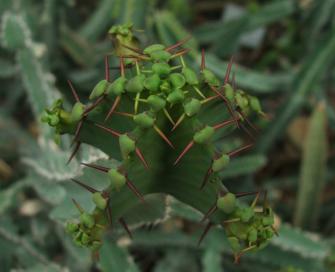 Euphorbia trees are well represented in the bushveld and some of the arborescent species were introduced into the conservatory. These include: the naboom (E. ingens), E. confinalis, E. excelsa, E. lydenburgensis, E. grandidens, E. cooperi, E. zoutpansbergensis, and E. rowlandii. E. grandialata is a spreading shrub with very attractive mottled stems. E. grandicornis is similar but green stems and longer spines. E. keithii, a rare endemic from the Lebombo Mountains also thrives here. The aromatic Syncolostemon canescens, Plectranthus amboinicus and Plectranthus venteri both shrublets from the bushveld have been used throughout this section as a chemical deterrent to insect pests. Bushveld plants are well adapted to disturbances. Aaron’s rod (Tinospora fragosa) or wonder plant is a creeper with succulent stems as thick as a man’s arm and beautiful heart shaped leaves and red berries. When parts of the plant are detached by animal disturbances, the broken section grows a survival root at the rate of 1,5 cm per day. This can happen 4 m above the ground level. The initial root is thin and once re-rooted continue growth. If broken again the plant refuse to give up and simply grow a new root. It is deciduous losing its leaves in winter. Roots only start re-growing during the rainy season in summer or autumn. The vernacular name Aron’s rod is derived from the biblical incident and dispute over leadership. It was Aron’s rod which sprouted, proving him the true leader of Israel (See Deuteronomy 24). Bushveld plants are well adapted to grazing, for example, when mother-in-laws’s-tongue (Sansevieria spp.) are grazed the stolons remain unharmed and resprout again. Other interesting succulent plants include the thickset Impala lily (Adenium multiflorum), when in flower, its striking pink flowers always draw attention. The kudu lily (Pachypodium saundersii), a succulent plant with a succulent stem bearing spiny stems and white flowers, is not a true lily, Other noteworthy introductions include the snake kambroo or slang-ghapie (Ceropegia stapeliiformis), bushman’s pipe (C.ampliata), Soutpansberg carrion flower (Stapelia clavicorona), S. gettliffei, S. gigantea (above) and Huernia zebrina. The bushveld region of Mpumalanga is rich is Cycad species and the Bluyde River cycad (E. cupidus) has been introduced. These palm-like plants produce cones (males and females separate) and are very popular collectors items. Adenias are also known by the common name elephant’s foot. 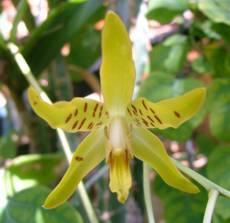 They belong to the granadilla family (Passifloraceae). Four species have been planted, all with a large, green-mottled and succulent, stem base (caudex). The spiny elephant’s foot (Adenia spinosa) has spiny stems. 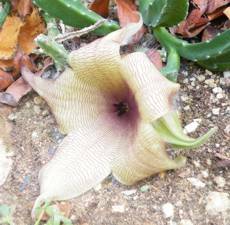 Other species grown here includes the blue elephant’s foot (Adenia glauca), python adenia (A. fruticosa), snake adenia (Adenia gummifera), scorpion adenia (A. digitata), heart-leaved adenia (A. hastata) and the rare Limpopo adenia (A. wilmsii). The last three have subterranean swollen stems and climbing stems. Hardy’s wild grape (Cyphostemma hardyi) is a succulent plant from the Waterberg bearing large winter deciduous leaves. Some perennials from the bushveld which have been planted include Crossandra fruticosa, C. greenstockii and C. zuluensis. These have orange to orange-red flowers. 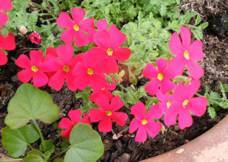 Another very attractive plant which has only recently been named is the Thabazimbi red phlox (Jamesbrittenia bergii). This perennial has crimson coloured flowers flowering throughout the summer months. Plectranthus tetensis is a ground cover used throughout bearing purplish flowers and P. xerophilus an erect growing shrub from the central bushveld (Limpopo Province). for more information on the plants and how to grow them.